The size chart under Description on Full Aperture (Solarlite) page lists sizes by clear aperture (filter size in center of cell) and outside diameter (O.D.) of aluminum cell (inside cell wall that fits over and around telescope tube). The O.D. 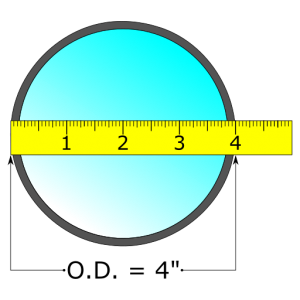 of our cells needs to be at least 1/16″ larger than the OD of the telescope tube or binocular barrel etc. Choose the closest cell O.D. that is LARGER than the O.D. measurement of your instrument. Example: Part number S-4250 (4 1/4″ O.D.) would fit instrument O.D. measurements from 4″ to 4-3/16″. Do not choose a size the same as your O.D. since it will be too tight. Self adhesive felt is included for custom fitting. If your application requires additional felt; Velcro, felt, and other types of material can be found at most fabric or home improvement stores. We cannot take orders for felt. What is the difference between Silver-Black Polymer film and SolarLite film? Silver-Black is good for up to 100x magnification, SolarLite up to and over 100x. Are the filters completely safe? SolarLite and Silver-Black Polymer Films are completely safe for unlimited visual and photographic (16 f/stop reduction) use when used as instructed. Our filters also protect the camera sensor. Safe to view through the viewfinder with SLR’s that focus through the lens. Solar filter MUST be first in line from sun and in front of any telescope or camera lens or mirror. Filter should NEVER be used behind any lens, eyepiece or finder. This includes camera drop in holders behind lens. Do the aluminum cells come with thumb screws? Thumb screws may seem like a good idea, however, our extensive testing found that in most cases, it’s actually less secure than a felt lining which covers a lot more surface area for a secure, friction fit. If the tolerance is within a few thousandths of an inch, such as with eyepiece holders, it would be fine, but this is rarely the case. Thumb screws can also dent and scratch the tube and put strain on the filter. Thumb screws are simply a “one size fits many” manufacturing shortcut and provide a false security. No, all the heat and intense light is blocked before it can enter the telescope. Your telescope may get warm from sunlight shining on it, not from the small amount of visible light transmitted through the filter. Sunspots and surface granulation are the two main features. Solar image with SolarLite and Silver-Black Polymer film is yellow-orange. The only detail that cannot be seen with a standard filter (commonly called white light filter) are prominence and flares which require our highly-specialized H-alpha Filter System. What is your return policy? All Thousand Oaks Optical products may be returned within 30 days for a refund less shipping cost. Product must be in new unused condition without any felt or Velcro attached and in original packaging. Warranty repairs are returned with shipping prepaid.